On our first trip to Budapest, we fell head-over-heels for the city’s thermal baths, striking architecture, and rich culture, not to mention its unexpectedly amazing food. So, of course, we raced back for more. This time, we got to dig a little deeper into all of those things. First up was a dinner tour sampling as much traditional Hungarian food as possible. Most food tours allow you to try tapas-sized portions at a number of restaurants or food stands, popping in and out after a few minutes and a brief description of the dish’s history and ingredients. 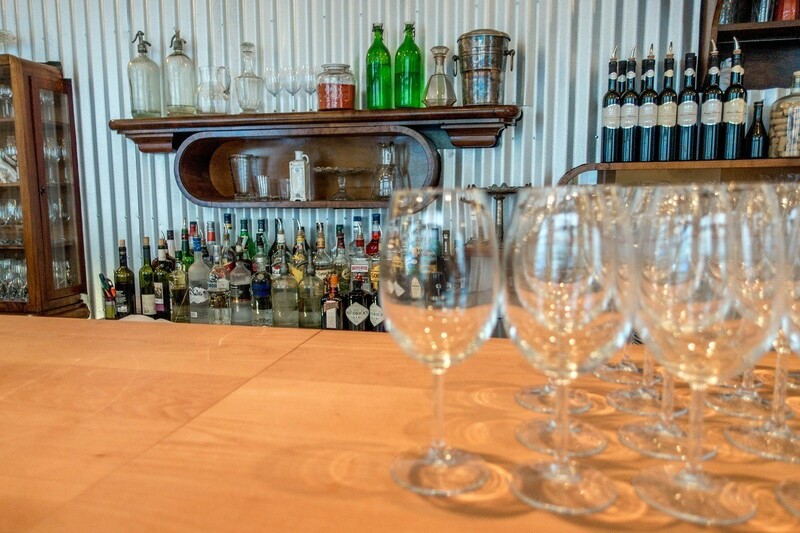 It’s a great way to sample lots of the flavors of a destination. But for our second visit to Budapest, we had a different experience on a progressive dinner walk. We leisurely dined on a full course off the menu from multiple spots. After all, why have dinner at one place when you can have it at five? The first stop on our dinner walk with Taste Hungary was actually the company’s own Tasting Table. 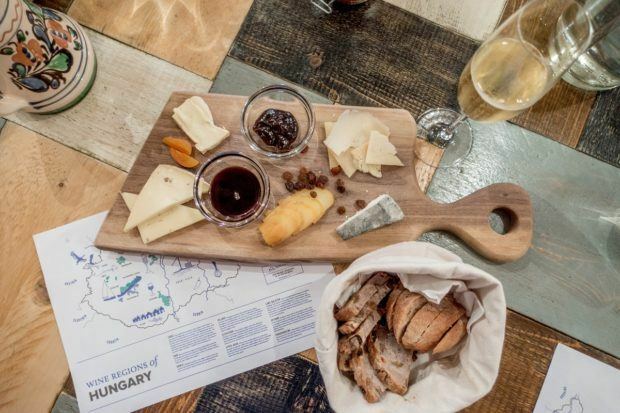 We tried a variety of cheeses and one of my favorite Hungarian foods: wine. The Tasting Table is a hybrid wine store and tasting room that carries over 200 wines from around the country, so it was the perfect place to add to our knowledge of Hungarian wines. We tried a sparkling wine from a region in northwest Hungary called Somlo. A blend of Furmint (a white Hungarian grape) and Chardonnay, it was fruity but not sweet and a great accompaniment to the cheeses. All the cheeses served at the Tasting Table are from small artisanal producers, and we had our fill. Our favorites were a rich Hungarian brie and a smoked cow’s milk cheese called parenyica. They were served with several different condiments including roasted pumpkin seed oil and truffled plum jam, which sounds unusual but is spectacular. What’s not to love about truffles? For our appetizer after the appetizer, we headed to a nearby Jewish restaurant. 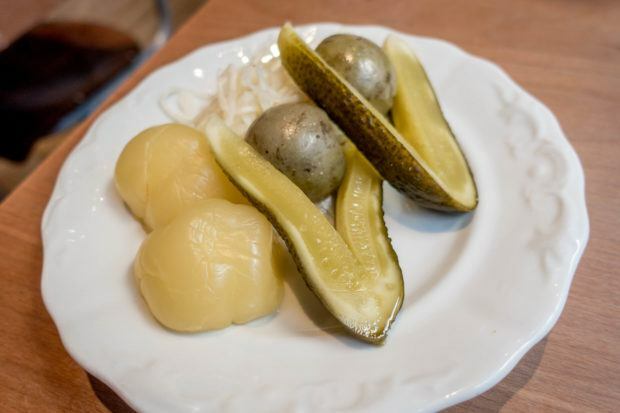 Hungarian food has been heavily influenced by Jewish culture over the centuries, so a lot of traditional Hungarian foods are also traditionally Jewish. Our mission for this stop was soup. Our tour guide Zsofi explained that most meals in Hungary begin with a soup. If it’s warm outside, that’s no problem – Hungarians just opt for a cold soup instead. Since it was a warm summer evening in Budapest, a cold fruit soup (hideg gyümölcsleves) seemed to fit the bill perfectly. 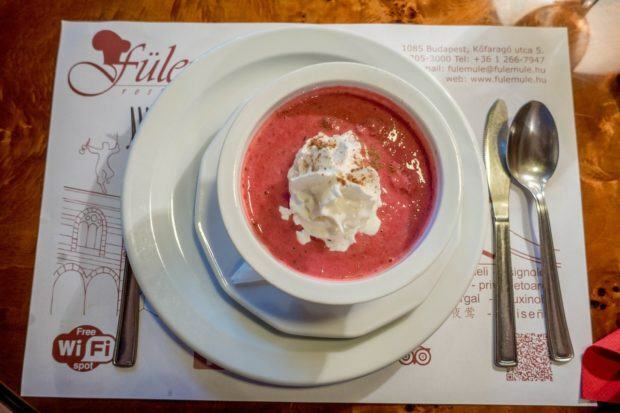 The slightly sweet soup is made of sour cream, sugar, and whatever fruit happens to be in season. Often, this includes the Hungarian’s favorite staple, sour cherries. My soup also included a variety of fresh berries. Before trying it, I was dubious about the bowl of pink cream, but it was actually quite good. 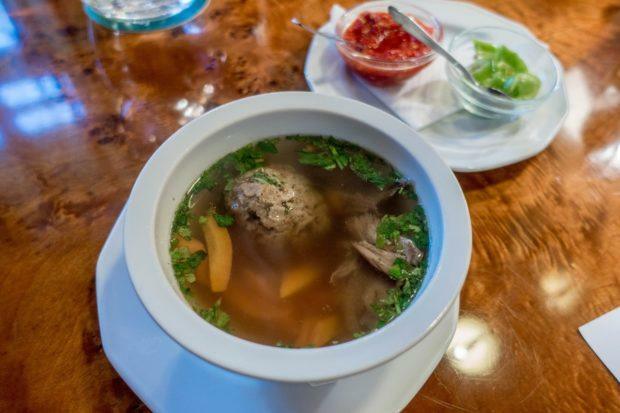 Also on the table for the evening was goose matzo ball soup (libaleves maceszgombóccal). It was flavorful and hearty but less to my personal taste. Next up was the main event, which meant our choice of traditional Hungarian food from the menu. 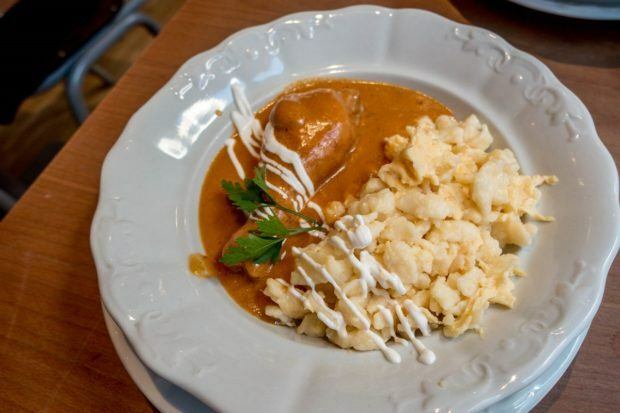 Even though we’d been to Hungary before, we somehow managed to leave without trying one of the country’s best known national dishes, chicken paprikash (paprikás csirke). We wouldn’t make that mistake a second time. Before we knew it, the table was filled with nuts, goose cracklings, pickles, and a variety of entrees. Our favorites were the chicken paprikash (of course) and the Hortobagy pancakes (Hortobágyi palacsinta). The name of the chicken dish comes from the liberal use of paprika, a key ingredient in much of Hungarian cooking. The meat, which is usually served with a gnocchi-like pasta, is simmered for a long time and then topped with a sauce of sour cream, paprika, onion, and mushroom. The pancakes are savory, crepe-like wrappings filled with meat, onions, and spices. It was all accompanied by a dry Hungarian rosé wine. 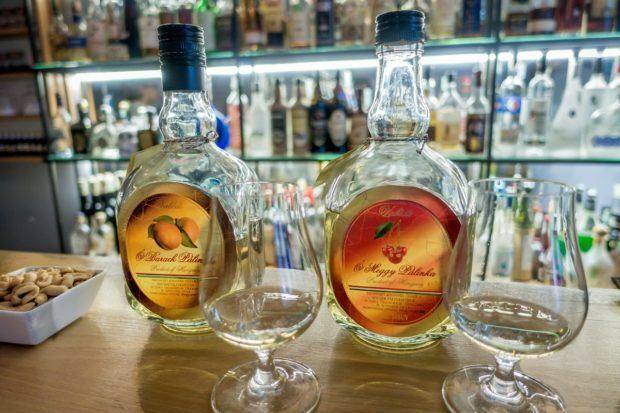 Many Hungarians begin or end a meal with a shot of palinka, a traditional fruit brandy. Who are we to buck tradition? After the mains, we were off to our fourth stop, a new cocktail bar in Budapest’s Jewish Quarter. Pálinka dates back at least 600 years in Hungary. 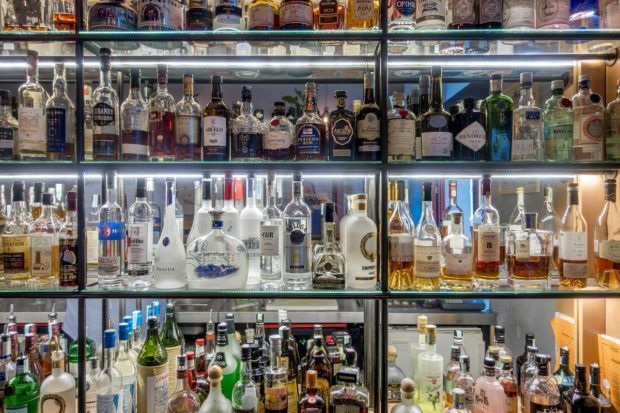 Only spirits made from fruit that is mashed, distilled, and bottled in Hungary (and apricot spirits from a small region of Austria) can be called palinka. At 37.5% alcohol, this strong brandy is not for the faint of heart. We chose to try traditional apricot and cherry varieties and loved every sip. The end of the evening found us at a café across the street from the famous Hungarian State Opera House eating what else but opera cake. 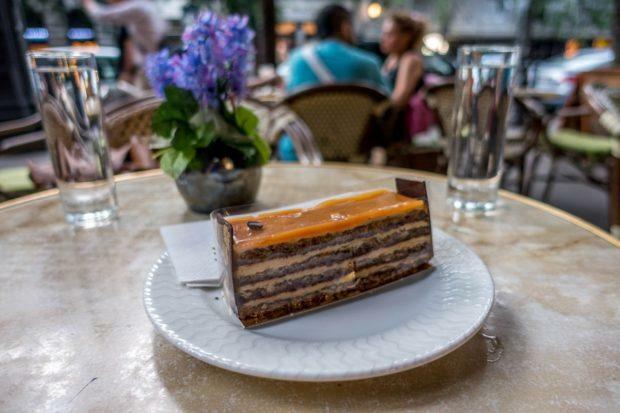 There were dozens of choices, but we opted for the multi-layer dessert that is also known as Dobos torta in Hungary. Dating from the 1880s, it was a favorite of the Emperor and Empress of Austria-Hungary. And it’s easy to see why. Sponge cake layered with chocolate buttercream and topped with caramel is pretty much my idea of heaven and the perfect note on which to end our dinner of decadence. When: Taste Hungary’s progressive dinner walk is available almost every evening at 5pm, depending on the season. Please consult the website for exact dates. We were the guests of Taste Hungary. All opinions of the savory and paprika-filled Hungarian food are our own.